#JonnOnTV: Have I Got News For You returns for its 56th series on BBC One from 5 October at 9pm. 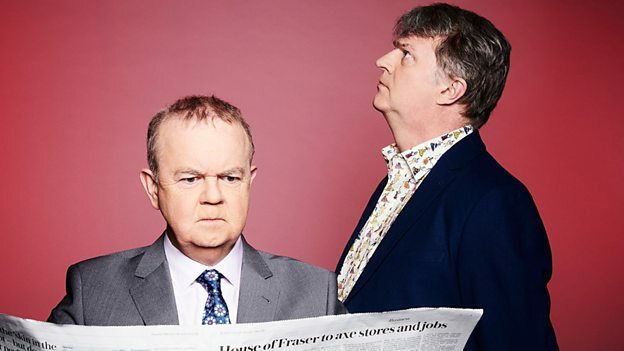 Have I Got News For You returns for its 56th series on BBC One from 5 October at 9pm. 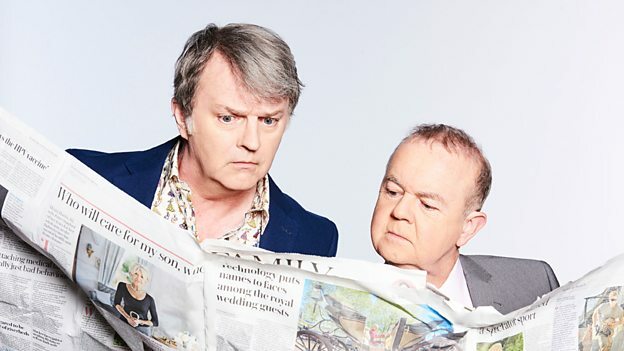 Team Captains Ian Hislop and Paul Merton answer Emma Cox's questions about the popular satirical news quiz. 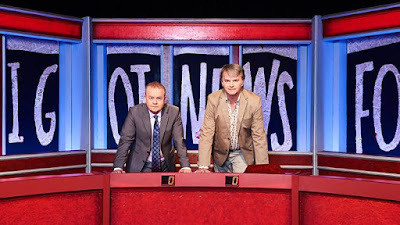 What is the secret to Have I Got News For You’s longevity? Paul: "You have five people on the screen every week, three of whom weren’t there the week before. "So there’s a freshness immediately to what you’re seeing and what you’re hearing. "And because the subject matter is the news, which is always changing, you’ve got a freshness of approach there too. "If we just did the week’s two top stories every time in the first bit of the recording, that would get boring. "But the first story doesn’t have to be the biggest one. When we did the hummus shortage, that was a huge middle-class story! Ian: "I don’t think there was a bigger middle-class story in the whole year!" Paul: "Ian is very good at what he does because he does both the comedy and also the serious stuff. He says what he thinks about stuff. But that’s not me." Ian: "And also every recording is a different atmosphere because of the people there and it’s a different audience and you’ve got a different set of reactions to people who may or may not get on, who may or may not find each other funny. "I don’t know about Paul, but I still get nervous. Our audience is very sharp. Paul: "Ian gets nervous because he does it twice a year but there’s a gap of several months when he’s not doing it. Because I’m doing it with The Comedy Store Players all the time I don’t really get nervous. I get ready but not nervous." Ian: "I remember Paul once said he was accused of preparing for the show by someone and he said he was going to sue. "I think that was probably the only time I’ve agreed with a writ - I thought that was absolutely monstrous to suggest that either of us would do anything to prepare! "No, the whole point is we turn up and create the show there. The one thing we’ve realised that our audience don’t like is a feeling that this is prepared." Paul: "Ian’s right. There is a sort of lightness and the audience can tell the difference immediately between somebody saying, ‘Okay there’s a big story this week so I’m going to write five jokes about it and trot them out’." If a big story breaks on a Tuesday or Wednesday, is your first reaction, ‘Oh this will be good for the show’? Paul: "It depends what it is. "If it’s a terrible disaster or a terrorist action, no. You think, ‘Are they going to include this, how are we going to do it?’"
Ian: "Usually I find if a really large story breaks, (a) it gives you something to say but also (b) it may be that everyone else has already been there and done it before we film. So, there’s a slight imperative to be better [than the competition]." Paul: "If it breaks at 6 o’clock on a Thursday night, an hour before filming - which has happened a couple of times - then it’s a completely different thing." Ian: "What we really like is when the story breaks when we’re on air and then Steve (the floor manager) has to come on and tell us - the last election show where everyone resigned, Steve had to come on and update us every 10 minutes! "It’s a perfect improv because there isn’t any time to think so often that’s when the show feels really fresh." If you’re sitting at home and Theresa May is dancing in front of South African children do you sort of think, I wish she’d just waited four weeks until we were back on air? Paul: "No, because you can still say ‘This is a bit like watching Theresa May dance in front of a load of African children’. It can still be funny later." Ian: "I’m very keen on that round but usually it’s Prince Charles who has to do the dancing. "I think from my point of view, it’s an interesting political shift in that it used to be the heir to the throne who had to look absurd in foreign countries. "Now it’s our Prime Minister. What’s happening? It is harder when the news doesn’t change. When it’s fresher it’s better." Paul: "Trump is something I find it hard to be funny about, I can’t say anything that’s fresh about him." Ian: "The week of Trump’s election, the big story for Paul was the fact that Toblerone were increasing the space between the wedges. I’ve rarely seen such genuine passion." Paul: "It was my childhood!" What makes a really great guest for you? What qualities do they need to have? Paul: "The ability to listen and join in." Ian: "I have a specific interest in unwary politicians who agree to come on and are amazed at what happens next. They’re my favourite. "But also there are people, like Ross Noble, who are regulars who come on and they’re just always good and it’s just such a pleasure when you know they’re there." So who are some favourite ever guests then? Paul: "Spike Milligan, Peter Cook. Janet Street Porter’s always funny." Ian: "I liked Conrad Black, Alistair Campbell. Well, I liked having them on. "Conrad Black was a cracker. He was quite uncomfortable. I suggested that the fact that he was guilty of fraud was quite interesting. He kept saying he was innocent. I kept saying, ‘That’s not what the jury said’. That was very entertaining. "Who else? 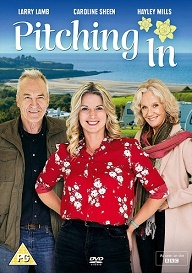 Victoria Coren Mitchell used to be a regular favourite guest, but she now hosts it and is always good. "Lucy Prebble, she was great, she’s now done it twice." Paul: "Yes, very good, very confident. It’s people that, so long as they’re trying, and they remember that they’re not watching the show, they‘re in it." Ian: "The great thing our producers do is just find new people. I liked Lucy Prebble because she was a playwright and we hadn’t done that before. "And we’ve had people like Robert Harris on and he was great and he’s a novelist. You get people from other worlds." Paul: "They don’t even have to be funny, just interesting." Who is the dream guest? Ian: "Well I’d like Blair. I think he’d be terrific." Paul: "And I think Lionel Blair’s an excellent choice [laughs]. "So that can be both our answers. Tony Blair and Lionel Blair. "It might be confusing to have them on the same show though. I could swap them half way round and not tell anybody." And what would you ask Blair? Paul: "Well, how long have you been a dancer? That sort of thing (laughs). "Actually, that would be the funny thing. You could ask Tony Blair about dancing. "And then you ask Lionel, ‘So, these weapons of mass destruction…’"
Ian: "Where are they, Lionel? Come on. "The show with Bruce Forsyth has got to be one of the oddest things that’s ever happened on TV and probably, I think it was Paul’s favourite show, wasn’t it?" Paul: "Yes, just about, I would say so, yes. It shouldn’t work but he was so good at what he did, and he had nerves of steel. He was used to going out in front of 2,000 people at the London Palladium. "He was very nervous before we went on, when I was standing backstage with him, because he didn’t know how the audience would react. "So, he’s not going on thinking ‘Okay, they’ll love me they’ll think I’m fantastic’ and falling flat on his face. "He’s thinking, ‘I hope this is going to be all right’, and as soon as he went out - whoosh, he was away! "He was incredibly charismatic and skilful so somehow made it work when he started doing Play your Iraqi Cards Right…"
So going back to Tony Blair - has he been asked? Ian: "Yes, I think he has been asked but I haven’t seen the written response [laughs]. "And presumably we can’t afford the fee because he’s very busy doing the Kazakhstan toilet industry’s federation evening which obviously sets him back." Paul: "I did wonder who got that gig. They said there was one guy ahead of me…"
Ian: "No, I just think [Blair] would be very interesting. "The great thing about having those sorts of guests on, and it happened when we had Paxman on and it happened when Campbell came on, they’re used to being in charge. "But when you’re recording a television show as live, essentially no-one’s in charge, including the person in the chair." 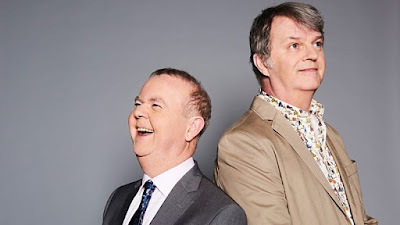 Paul: "Jeremy Paxman particularly, the first time ever in his television career, he said something, and I said, ‘Well that’s a load of old rubbish’. "And he can’t come back to me and say, ‘Yes but what about your education qualifications?’. I haven’t got that! And you can’t give me a starter for 10 because I don’t care. I don’t want to get the question right." Ian: "I think ‘You patronising git’ was the phrase to Paxman which no-one’s said to him for a while. It was Steph McGovern. It was very funny." What happens in the Green Room afterwards? Paul: "Drinks afterwards, a sort of quick chat with producers sometimes when you say, ‘You’re going to keep the bit about the onion aren’t you?’"
Ian: "I always go to the Green Room thinking, ‘Are the guests going to be there?’, because sometimes people leave, and they don’t come and have a drink afterwards. "Sometimes it’s a bit frosty. John Prescott was not thrilled after the show he was on. He found it less funny than I did. "So, there’s always a bit of that for me, who’s going to be there and will they have left or will they be having a drink through gritted teeth?" Paul: "Most people do come up, most people do. Most people are game for a drink afterwards. We certainly are. "After two hours of thinking on your feet, you want to unwind afterwards." 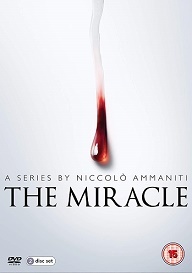 Can you make any predictions about what you’ll be talking about in this series? Paul: "The big American elections, the mid-terms happen in November so that’ll be a story one way or the other for us." Ian: "Domestically we’ve got a situation where all three parties are full of people who want to split, which is quite new and none of the party leaders are safe. "So, you’ve essentially got parties accusing each other saying ‘Well, you’re pretty divided’ and the other going, ‘Not compared to you we’re not’. "So, it’s an extraordinarily chaotic period and there’s not much evidence that anyone’s changed their mind." It’s not just Trump that talks about ‘fake news’ now - people trust news sources less and less than they ever did. How does that affect your programme? 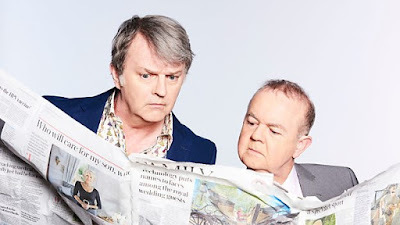 Ian: "I think one of the most cheering things about Have I Got News For You is quite a lot of people get their information from us, which should be terrifying in a proper functioning society! "I walked in through the door of this hotel today and a man came up and said, ‘I absolutely love Have I Got News For You’ and I said ‘That’s really nice of you’. "He said, ‘I’m from Israel, he said, it’s the only sensible news we get’. And you just think, ‘Oh’. "We’ve got a very big fan base among immigrants and people from backgrounds where they can’t believe you’re allowed to be this rude, which is a thrill compared to the countries they’ve come from. But also, they get a version of the news which they’re not used to, which is a rather more subversive take." Paul: "People certainly do that, that’s certainly part of the element of its longevity is that people come to it for the news. "But I feel that people trust it. That if Ian says something or we say something, we show something - our view is trusted implicitly. "I think they trust Ian. Seriously, they do." Are there any advances in technology that have had an effect on the show, such as social media? Ian: "The news cycle has speeded up but there is a very good movement called Slow News, which is just suggesting it takes a bit longer to digest it and have anything interesting to say, which I agree with. "People do say, ‘Why isn’t Have I Got News on every day?’. "Well if you look at programmes that react to something every day, there’s very little to say because you don’t know anything yet. It’s literally like ‘Well we’ve got this footage and there’s some guys in uniform running about but we don’t know what’s going on’. "And that’s no use to anyone and (a) you can’t work out what’s going on but (b) you certainly can’t offer any jokes about it because you don’t know what’s happening. You need time." Paul: "We’re not a big enough island to have a whole plethora of news happening every day. 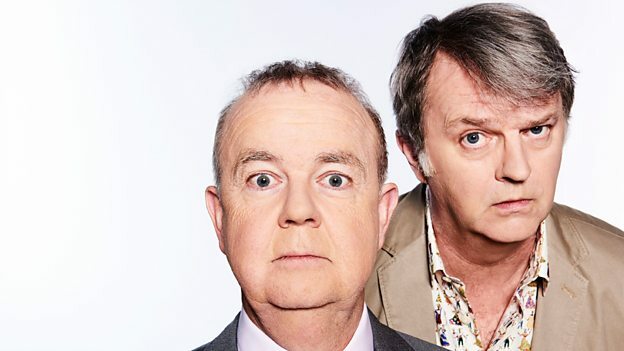 "You could try to run a topical satirical show from Monday to Friday and it’d fail because there isn’t enough material (a) to inspire you, (b) to get a good script in time." Paul: "There used to a man pretending to be me on Twitter, but he only ever posted one tweet, and it was round about May and he said, ‘Oh well, time to fire up the old barbecue’. That was it! "Why not say, ‘I met Stephen Fry at the Groucho Club, went round to Ian’s, he’s just come back from holiday in Thailand’ - why not make up something interesting? "I’ve never fired up a barbecue in my life." By not being on Twitter, you’re missing Piers Morgan knocking ten bells digitally out of Alan Sugar. Paul: "Not as good fun as in a real boxing match." Ian: "I’d enjoy seeing that." Paul: "I’ve always respected Ian. From the first time I met him really and knowing the job that he does as the editor of Private Eye. "So, I realise he does both and so sometimes Ian doesn’t get the credit for the comic stuff he does as well on the show which is very funny. "We are similar in the respect of how we view what we are doing, and we want it to be the best that we can do at any particular time." Ian: "Whatever our differing attitudes to life and in the early days, I think I had to prove myself to Paul because you know, he just thought, ‘Stuck-up twit’, which is perfectly reasonable." Paul: "Stuck up Oxford twit." Ian: "Stuck up Oxford twit. All of that was perfectly acceptable and true. But also, we realised that what we both enjoy doing was this show and doing it in our different ways. And the basic thing is, Paul makes me laugh and you can see it on the show. I enjoy myself. It’s a real pleasure and that hasn’t gone at all." "We have had a drink after every show for the entire 28 years." Paul: "Sometimes we tell the same joke at exactly the same time. 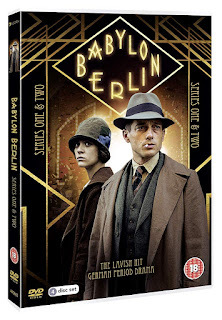 There was one last series. We’re so comfortable in each other’s presence, it can be almost telepathic when it’s going well." Ian: "What I really like is when Paul says stuff that I haven’t even thought of and wouldn’t. That’s the pleasure of someone else’s mind." Paul: "Whenever we’re off air people say, ‘When are you coming back?’. "It’s good to be missed. You’ve got to get away from it and then come back to it renewed and refreshed. "We have a run of ten from October to Christmas which is always the best period with lots happening." Can you tell me something about the other person that would surprise me? Ian: "When I first met Paul, I thought I knew quite a lot about classical music, for example, but now Paul knows more about that and indeed most other subjects than I do. "I feel that I’ve atrophied somewhat. He is much, much better read than he pretends." And you don’t stay in touch in between series? Paul: "Occasionally we might go out for a meal, but we do see each other four months of the year, every week." Ian: "And people do think we’re like Eric and Ernie. I think for a lot of people they genuinely think we share a flat and that’s how we live." Paul: "But we see each other 20 times a year already." Ian: "Which is more than most friendships. It’s certainly more than most marriages."